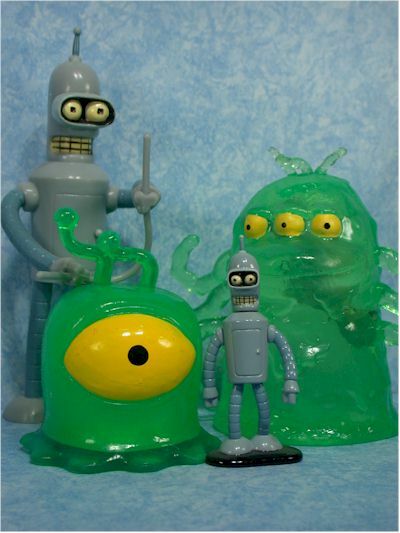 Today's guest review is of the recently released Futurama Brain Slug - take it away! Hi, my name is Rubio Medina and I am a big Futurama fan. I run my own website called A Big Piece of Garbage and am an administrator at a Futurama message board called the Futurama Foundation. Like most fans I am disappointed in the cancellation of the show not only because I won't get to see this well written animated series again but also because the amount of limited merchandising from the show will get even more limited. 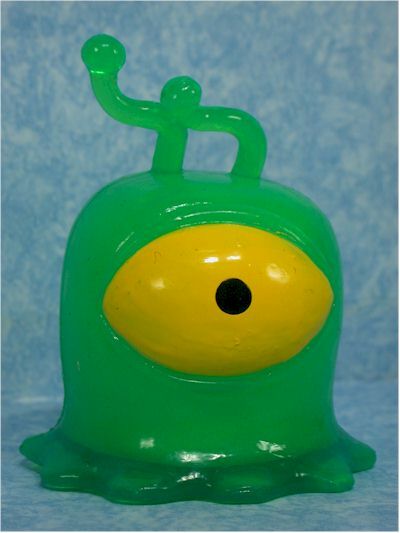 The Brain Slug squishy toy that I am reviewing here from Dark Horse Comics is one of the last items scheduled to be released in the near future and we can only hope that the syndication of Futurama on Cartoon Network and others will help to get more retailers interested again real soon. The Brain Slug comes carded which is a bit of a departure and a bit of a disappointment for me. I thought the diamond cut box the HG Blob came in was pretty fun whereas the packaging for the Brain Slug is pretty standard stuff. Still, it is done in the same retro packaging that so many Futurama products are done in and it leaves a fair amount of space on the back of the card for more informative text. One thing about the Futurama packaging is that even though there are set package schemes every merchandiser has done a little something extra to it to tailor it to that particular package. Here we get Fry with a poor brain slug attached to his head. Another great job by Dark Horse in bringing the brain slug to life. The only complaint that I have against it is that the antennae are not more sturdy and are made of the same material as everything else so they do not stand up on their own. It looks as though the packaging may play a little into this as some I have seen with the antennae kind of flopping over while others I have seen where they are partially erect. Minor complaints though. He is not to scale with any of the other Futurama toys but he is in human scale. I find that to give it a little bit of that cool factor. 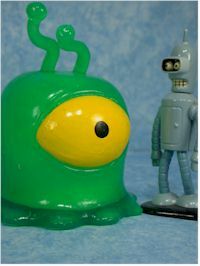 The HG Blob and the Brain Slug both have similar painting in that both have their eyes painted in as yellow with a black dot for the eye itself. It is the only paint on either figure but since the eye is so pronounced on the Brain Slug it brings any imperfections to the forefront. It is still not too bad but there are parts where you can see a little of the green behind shadowing thru. The quality seems to be the same as the HG Blob but Dark Horse may have made some minor improvements here. The liquid seems to fill the entire body cavity of the Brain Slug and that was something that some of the HG Blobs did not have. Also, I have not been hearing any reports of liquid evaporating from within the Brain Slug as was the case with some of the HG Blob figures. peel away and bounce to the floor. This is part of the fun of the Brain Slug as he really sticks to surfaces as you might expect an actual Brain Slug to do. The tacky quality does pose a small problem in that he will get dirty fairly quickly but you can wash him down once in awhile and the stickiness will come back. I do not suggest washing him too often or too vigorously as I can see the paint rubbing off his eye and then he wouldn't be able to see his next victim. Nothing. I don't know what they could have put in here so don't let the fact that nothing comes with it be a deterrent. What might have been fun would have been to have some type of string to secure it to your head for Halloween and for overall mayhem. The Brain Slug suffers from the same problem as all Futurama merchandise. It is just a couple of bucks too much. I think if this had been around 7.99 it would make it a better value especially considering there are no accessories whatsoever. At least the HG Blob squishies had an extra figure floating around in them. He is to scale though and that makes up a little bit for me. This is borderline ** 1/2 to ***. It would be nice if it were a little cheaper but the uniqueness, scale and the fact that it is show specific makes me want to pump the score a little bit on it. 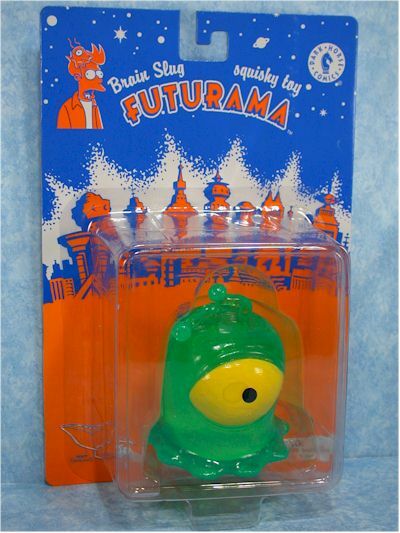 Overall if you are a Futurama fan I think you will like this toy. For toy collectors in general you might find the uniqueness of the item compelling enough to try out one of the squishy toys from Dark Horse. Still with the high price tag it does knock this down a bit but like most stuff from Futurama you will probably be able to find this at discount on either eBay or other outlets. - JGP Toys has the for $10, in stock. Great customer service is their standard. looking for one to open up, they have him listed for $10 here.